Marksmanship an activity that incorporates the highest degree of safety along with skill and fun. Shooters are required to wear shooting safety goggles. BB guns are used, with gun safety instruction and use of the command method of firing. 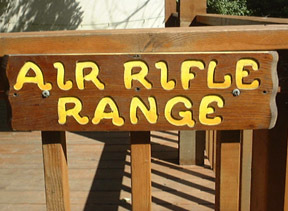 In the command method , campers check the safety, load, aim, fire, and put the safety back on. Non-offensive targets are used.